Description: Children�s parties are a weekly ritual in residential areas, which is good news for the village clowns that parents rely on to provide entertainment and keep the little ones amused. Most of the men and women working as clowns have no juggling or acrobatic skills, so they act as the organizer and master of ceremonies, playing games and telling stories to the young guests. Sigit, 35, is from Citayam in West Java, Indonesia and works as an on-call clown in the Sawangan and Cinere areas. He organizes three to four parties a week, usually being booked through an agent who specializes in promoting clown events. Sigit is paid Rp 200,000 (U$D19) for each event, some of which he pays back to the agent as a commission. 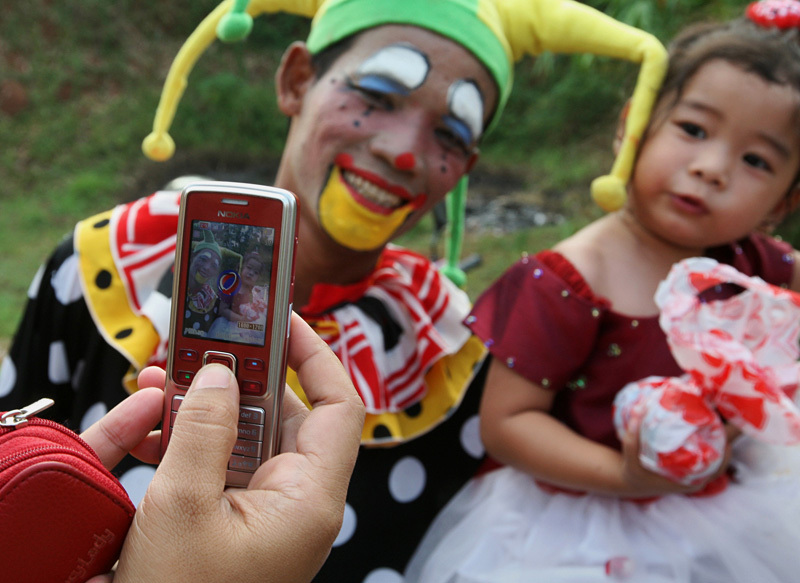 Caption: A mother using her cellphone to take a photograph of her daughter with Sigit.